I didn't think I'd do it this soon, but yesterday I published my first book on kindle! 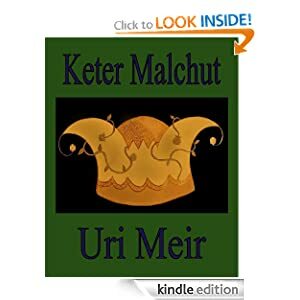 We are talking here about my book Keter Malchut that I've published in Hebrew in 2007. It contains five science fiction and fantasy stories in an Israeli setting. This book is my first effort in publishing, so there are many things that I'd do differently today, but hey it's only 2.99$! Mainly I wanted to see how this whole 'Publishing to kindle, and selling electrons to (potentially) the entire world' works. I guess I will find out pretty soon. Here is the link to the Kindle book. Here is the link to my Author page. I also made a Createspace Print on Demand book today - Wow, busy day! Feel free to share this information, of course!